I’m sure that by now you know our family adores Thomas & Friends videos. This particular video introduces a new engine friend, “Scruff”. 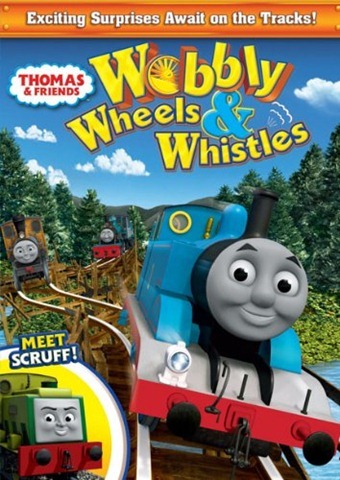 In four new episodes, Thomas & Friends teach the viewer things like friendship, cooperation and discovery. Even though this series is geared towards children ages 2-5, I can see my younger two watching Thomas for years to come… making these videos a great investment. Heck, even my 13 year old takes a seat to watch when they come on! One OurKidsMom is going to win Thomas & Friends Wobbly Wheels & Whistles on DVD! * Leave a comment telling me who your (or your recipients) favorite Thomas character is! You do not have to be a blogger to enter/win. An email address is required to enter. Please leave it in your comment. The winner will be chosen via random.org and contacted via email. A reply to the winning email is required within 48 hours before a new winner is chosen. This giveaway ends at 11:59 PM EST on January 18, 2011 and is open to residents of the US. Oops, forgot in my other entry, plse delete. Follow via GFC and my grandson LOVES Percy! I’m a GFC follower. Our favorite around here is none other than Gordon. Well, it has to be – my toddler, my husband, and my father-in-law all share his name! Following via Google and my kids love Percy! Liked Thomas & Friends on FB! Entered Change of Plans giveaway! I follow on gfc and my nephews favorite is Thomas. My son’s favorite character is Percy. My son loves Thomas of course! I follow you on GFC(Linda G) and my little guy likes Percy!! i follow with gfc. we love Emily. I follow your blog and my favorite is Percy. Thanks. I like Thomas and Friends on FB! Percy is one of the characters we like. Thanks. I entered the Tonka Giveaway! I entered the Change of plans kit Giveaway! I entered the B babybling Giveaway! I entered the Charlie brown Giveaway! I entered the Fireman Sam Giveaway! I entered the Joe Shopping giveaway! I entered the barney Giveaway! I already follow you and my sons favorite is thomas and my favorite is rosie! I follow via GFC. I like Percy. GFC Follower and we love Gordon! I follow you publicly on google friend connect Percy is our favorite. GFC follower as lewalk and we like Thomas the best. Lol. Nothing exciting or unique there. I follow ourkidsmom.com via google friend connect. My nephews love Gordon. I follow on GFC agatewood1 and my son loves Percy! I follow you by google friends connect and we like Thomas best . I entered the Shatobu shapeware giveaway. I’m a follower and my boys both love Thomas! I follow via GFC and my girls love ferdinand! I’m a GFC follower 🙂 We like Percy! We like Thomas or Percy, this would be for my kiddos! I am a follower; Rosie! Following via GFC, we love Thomas the best, thanks! I follow on GFC (mail4rosey) and Thomas is my favorite character. I like Thomas on Facebook (sarah Smile). Did mandatory. I have the day off, finally, tomorrow and I promise to get all your giveaways entered. Lol. Like Thomas and Friends on FB as well. Follow on Twitter as lewalk76 and tweeted. My little boy loves Thomas. I follow you with GFC and my favorite character is Toby. I like Thomas & Friends on Facebook.